On Jan. 11, residents at Atria Darien kicked off the first of several “Better Together” events, which focus on telling stories inspired by cards from the Atria-created game, Storywise. DARIEN — What was your first time on a plane? When was a time you surprised yourself? How did you discover something at which you’re skilled? 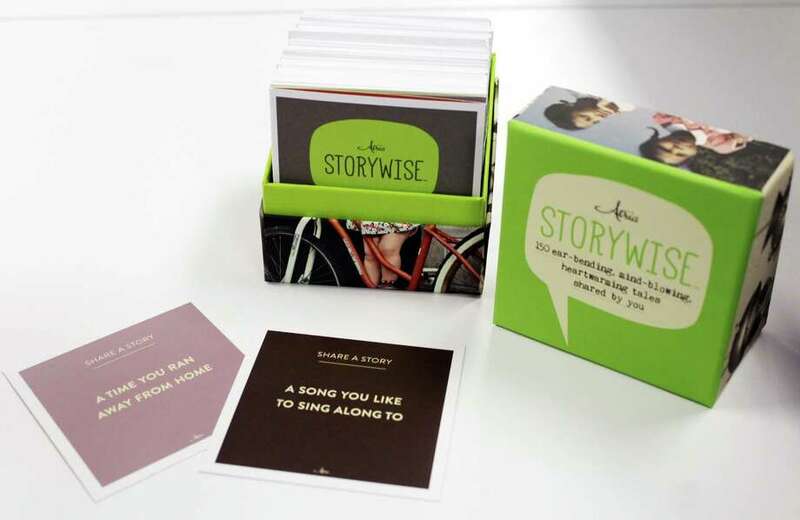 Questions like these unlock stories you might never bring up in everyday conversation, which is the goal of Storywise, a series of questions presented in a boxed set of cards created by the senior housing company Atria. Residents at Atria Darien, as well as members of the larger Darien community, will be answering these questions to spark conversations at the assisted- living facility. Residents will be invited to answer questions from Storywise as part of “Better Together,” a series of events that take place at the 200-plus Atria living centers around the country. All 78 residents at Atria Darien received the box set. The senior living chain created the game and gave it to residents and their families as a holiday gift. The game is also available as a free iPhone app where users can record and keep their stories. For every story shared through the Storywise app, Atria will donate $1 to the American Library Association. The first event in the series kicked off Jan. 11 across the country. At Atria Darien, various community members were invited to join residents in their storytelling, including Darien Toy Box owner Bill Jensen and students from Darien High School’s Fitch Academy. For information about the “Better Together” series, contact Beth Blake at 203-662-1090 or elizabeth.blake@atriaseniorliving.com. Blake, who took part in the event, was surprised by the things she learned. Several residents in her small group found out they were from Pittsburgh and somehow all ended up moving to Darien. Fitch students and staff, Atria residents and staff members gathered in one meeting room at Atria. Together, they went in a circle, pulling cards from the box and answering various questions ranging from everything from their favorite sound — the ocean — to the first thing they noticed about their true love — his kindness. Generational differences were clear as one student shared their favorite family photo was a group selfie, while someone else shared a memory of their grandfather carrying a pocket watch. However, Blake said from speaking with participants, she found people of all ages found things in common. “It was created with seniors in mind, but people of lesser ages have just as much fun,” Blake said. “Better Together” events will continue throughout the year. Blake said Atria Darien is hoping to collaborate with other community groups and members, either at Atria or around town, as a way to spread the spirit of storytelling throughout the community.